The Rosemary Orr Scholarship Fund was established in 2017 by a group of alumni of University College Utrecht, with the aim to provide financial assistance to students who have demonstrated perseverance and leadership amidst adversity. Through the financial support of students, the scholarship committee intends to honour the memory of dr. Rosemary Orr, a voracious proponent of Liberal Arts and Sciences education and a true mentor to many students at University College Utrecht. Rosemary Orr strongly believed that each story has a lesson to teach; storytelling is a valued skill that is used in various contexts - as tool for partnership brokering or conflict resolution. Therefore, candidates for the Rosemary Orr Scholarship are asked to submit a personal story as part of their application, instead of a regular motivation letter. The first full Rosemary Orr Scholarship has been awarded to a student starting her UCU education in September 2018. We are welcoming donations for scholarships for students starting in the next academic year (2019-2020)! Dr. Rosemary Orr, senior lecturer at University College Utrecht (UCU), passed away on 15 November 2016 after battling cancer. Rosemary received her bachelor’s degree in history and Germanic studies at Trinity College Dublin in 1987. For many years she was a full-time chef in Dublin before returning to academia, obtaining an M.Phil. in linguistics at Trinity in 1995, a field in which she remained active for the rest of her life. She obtained her PhD from Radboud University in Nijmegen in 2005. A phonetician by training, her recent research focused on accents, as evidenced in her UCU Accent Project and the Sprekend Nederland project, which captured national attention in the last year of her life. Universally regarded by her colleagues as an outsized personality, Rosemary was a leading light in college life. Above all, she was a dedicated and talented tutor and teacher whose combination of high standards, humour, storytelling and encouragement deeply impacted the lives of many of her students. 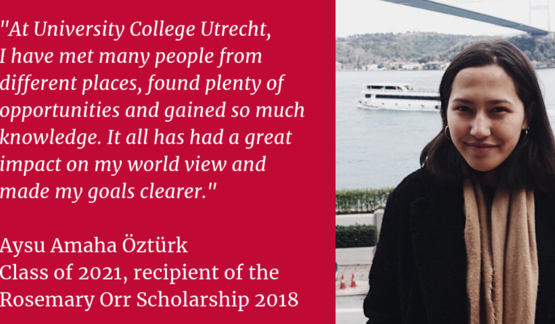 Please consider a donation to the Rosemary Orr Scholarship 2019 21-01-2019 | 11:37 Aysu is making the most of her education at University College Utrecht thanks to the support of the Rosemary Orr Scholarship 2018. Contribute now and enable a new student to do the same this year!